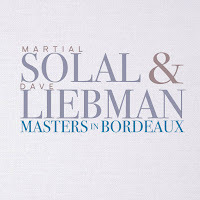 Recorded at the 2016 Jazz & Wine Festival Bordeaux, "Masters of Bordeaux" (Sunnyside Records) finds pianist Martial Solal in a set of duo conversations with saxophonist (soprano and tenor) Dave Liebman. The two did not play together until the tour that accompanied the appearance at this Festival but they sound like old friends as they move through the program, six recognizable standards that the duo make sound fresh. 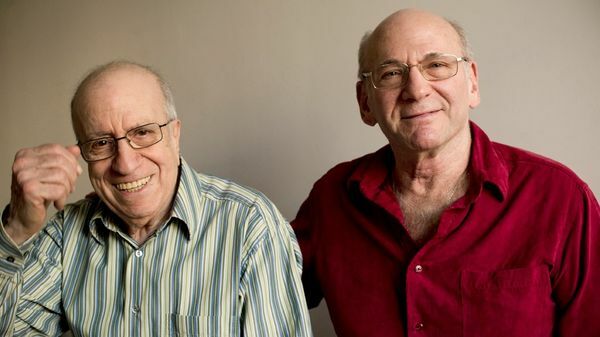 Solal, 19 days short of his 89th birthday, and Liebman, one month shy of his 70th, do what one hopes masters will do; that is, the music they create keeps the listener glued to his/her seat wondering where the pieces will go next. 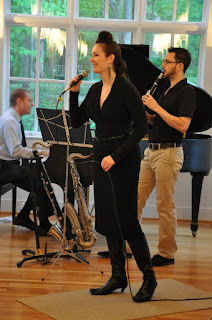 Opening with "All The Things You Are", the duo, with Liebman on expressive soprano sax, dance their way through the Jerome Kern/ Oscar Hammerstein II classic. Liebman switches to tenor for their exploration of Cole Porter's "Night and Day" yet, after his excellent solo, Solal's far-ranging solo stands out for its inventive is of melody and shifting rhythms. Back to soprano for Miles Davis's "Solar", the duo dance through the melody while the solos will make smile, even gasp at times, at the melodic and harmonic leaps both musicians take. Honestly, there's not a weak moment on this recording. 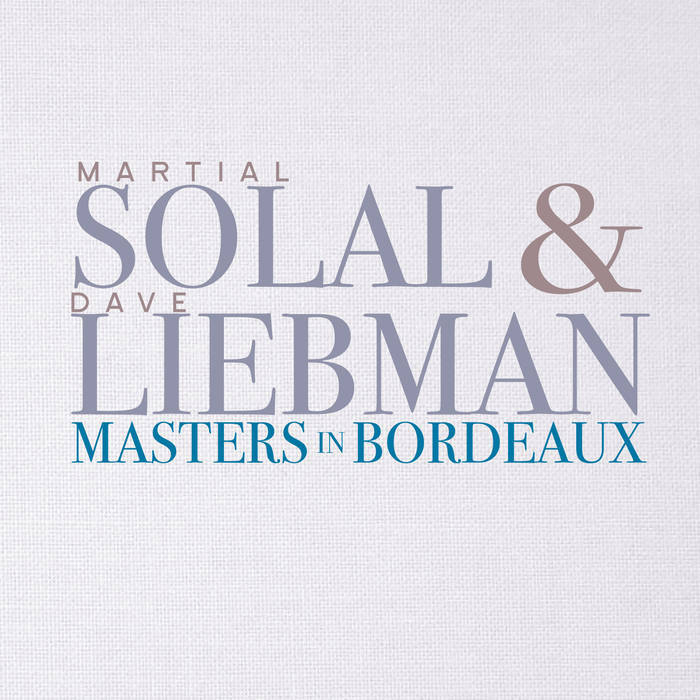 Both Martial Solal and Dave Liebman are on top of their game, taking chances because of their mutual trust and love for improvisation yet never ignoring the songs. "Masters of Bordeaux" is an apt title for these two musicians are truly masters of music and, in the parlance of the best red wines from the region in which this concert took place , are "Premier Cru Classe." For more information, go to www.sunnysiderecords.com/release_detail.php?releaseID=896. "Trio" contains a lot of music (72 minutes), is composed of most original works (11 Sun tunes, one standard, and two group pieces), and goes in myriad directions. Opening with "Tranaccidentation", one immediately hears how the three musicians listen closely to each other, how Sun does not force the action and has a subtle, softer, tone on tenor sax. In fact, it's Stinson and Honor who push the piece forward in the manner of bassist Fred Hopkins and drummer Steve McCall of Trio Air. Sun moves to clarinet on the next track "Loading Screen", the angular melody paired with the clanging percussion and bass counterpoint. The C-melody saxophone shows up twice, first in the mysterious group piece "One Never Knows Now" (Stinson's impressive bowing underpinning the improvisations) and then on the standard "All of Me" - Sun's softer approach on the saxophone leans more towards Lester Young yet the brisk tempo and his delightful solo has a good dollop of Sonny Rollins in it. Several pieces contain great power. "Announcements" is a frisky romp that drives for the entire 2:13 while "Misanthrope" has a "heavy metal" feel at the open, Nirvana-like with bleating saxophone and crushing drums. "Air Purifier", at nearly 12 minutes, is the longest track and goes through a number of changes in tempo and dynamics, with Sun moving from clarinet to tenor after the opening section. There's a powerful bass and drum conversation before the piece slows again; Sun goes back to clarinet, plays a somber melody, and the bassist takes the lead. The somber tone lasts through the close of the piece. 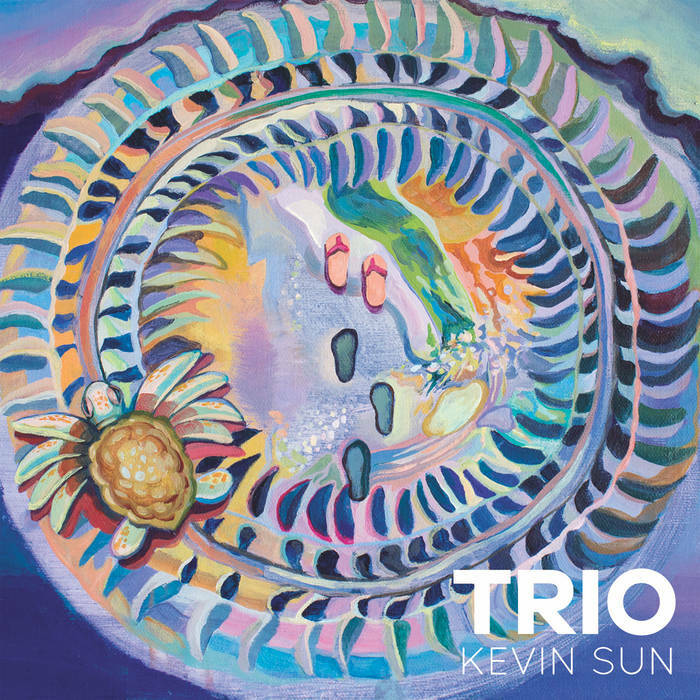 There is so much to explore on "Trio | Kevin Sun" and I know hard it can be sitting through a long program. But this music is worth the time and effort. The compositions are adventurous, the skill, effort, and ideas of the musicians stand out, and one wishes to be in the audience when they explore these pieces. 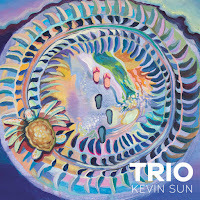 Go to thekevinsun.com/p/upcoming.html to find out when this Trio is playing near you - this is "alive" music and should be seen and heard. It's Valentine's Day 2018 and it seems obvious we could all use a "whole lotta love" (no Led Zep today though, thank you) and a revival of our spirits. 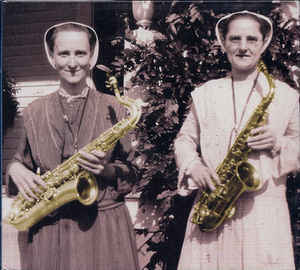 To that end, tenor and soprano saxophonist Jeff Lederer has come to our rescue. 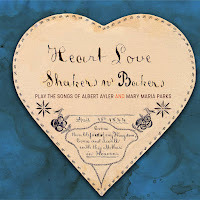 His Shakers n' Bakers crew has a new album. 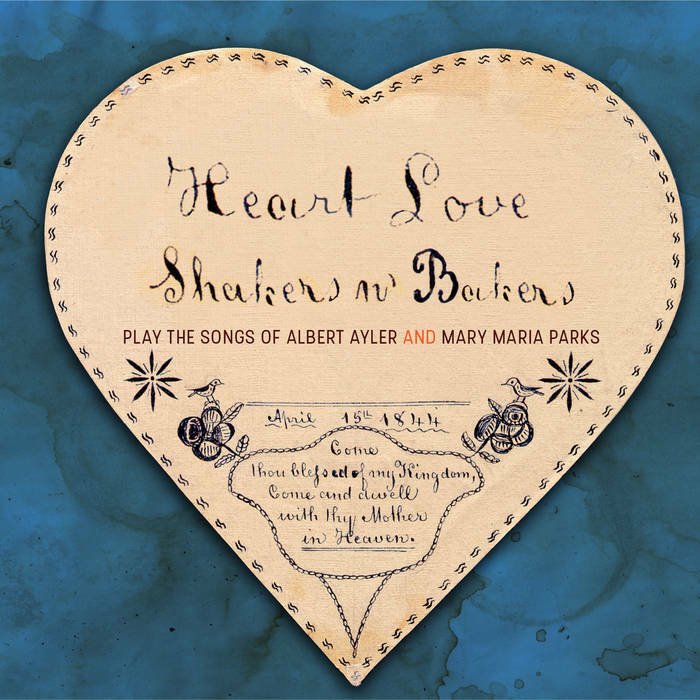 "Heart Love: Shakers n' Bakers Play the Songs of Albert Ayler and Mary Maria Parks (little (i) music) revisits and updates three tracks from Ayler's controversial 1968 "New Grass" (critics thought the funky sounds beneath Ayler's talent) and three from 1969's "Music Is the Healing Force of the Universe". Lederer has been one of the late Ayler (he died just a year after the "...Healing Force...." Lp was released) and has recorded several albums based on material from throughout the saxophonist's career. The ensemble includes Jamie Saft (piano, organ, Baldwin electric harpsichord), Chris Lightcap (bass), Allison Miller (drums), Mary LaRose and Miles Griffith (vocals) plus Steven Bernstein (trumpet, slide trumpet), Kirk Knuffke (cornet), Joe Fielder (trombone) and Lisa Parrott (baritone saxophone). Special guest Matt Wilson plays drums on two tracks a quintet of background vocalists known as the "Heart Love Singers" are featured on a number of tracks. They include Amy Cervini, Melissa Stylianou, Toni Seawright, Chelsea McLauren, and Ms. LaRose. The album hits the streets on February 28 but the digital version can be purchased starting today by going to shakersnbakers.bandcamp.com/releases. Listen to the track below and you'll get a good idea just how funky and far afield Shakers n' Bakers can go. The band plays with great fire, the vocalists are perfectly matched (sweet and sassy, smooth and gruff), and Jeff Lederer plays with the fire that his fans and audiences have come to expect. A review will post in a week or so but, for now, if this music fascinates you, give it a listen. Make sure to play it loud: it will do your heart good! 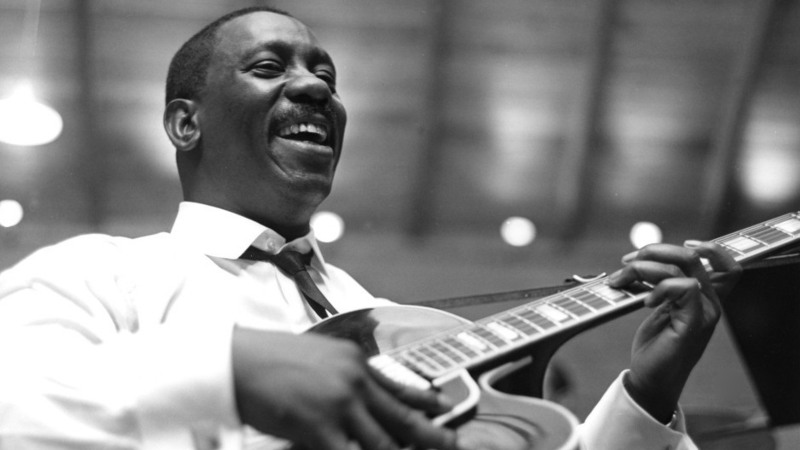 In his lifetime (1923-68), Wes Montgomery only made one trip to Europe as a professional musician (and none as a tourist). That makes great sense - he hated to fly! In 1965, he crossed the ocean via plane but crossed the European continent by train. The year before, he had moved to Verve Records and started to get popular acclaim. In 1967, he made the move to A&M/CTI Records and began a short but profitable career working with producer Creed Taylor and arranger Don Sebesky (with whom he had worked at Verve). Resonance Records has just released "Wes Montgomery In Paris: The Definitive ORTF Recording", a 2-CD set from his March 27, 1965 concert that has been one of the most popular jazz bootlegs of all time. 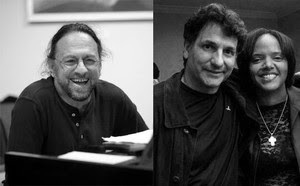 Reissue producer Zev Feldman was able to secure the master recording from the National Audiovisual Institute of France, the overseer of the Office of French Radio and Television (ORTF): working with Resonance label owner and sound wizard George Klabin and master technician Fran Gala, the album is finally official. 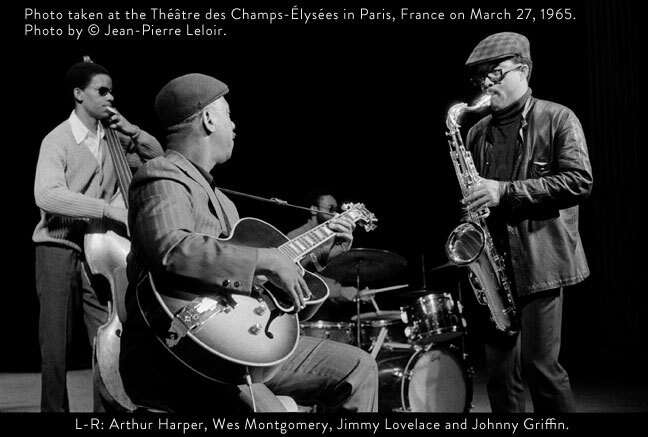 For the tour, Montgomery assembled a rhythm section that features pianist Harold Mabern, bassist Arthur Harper, and drummer Jimmy Lovelace. Of the 10 tracks, only one is less than seven minutes and several stretch beyond 12. Montgomery is in top form throughout the album. If there is one track that defines the album, it's the highly rousing rendition of John Coltrane's "Impressions." The guitar solo ranges from rippling single-note runs to his amazing "octaves" riffs and the jazzy block chords., all played as the rhythm section keeps up a torrid pace. Later on Disc one, the quartet plays Montgomery's "Jingles", another longer piece with great power and a stunning guitar solo. Mabern, 29 at the time, is inspired by the guitarist and delivers a powerful solo that swings with glee. The slower tracks on the first disk include a Latin-tinged reading of "Here's That Rainy Day" but the keeper is the truly lovely reading of "The Girl Next Door" (composed by Hugh Martin and Ralph Blane as "The Boy Next Door"). Disk two opens with "To Wane", a Mabern composition that matches the power and energy of "Impressions." Special guest tenor saxophonist Johnny Griffin joins the band for the next three selections. Now a quintet, they start with a famous Montgomery piece "Full House", a tune and album the guitarist and saxophonist recorded in 1962. Griffin's bluesy style fits well in this music. The ex-patriate saxophonist, who had moved to France in 1963, and Montgomery have great fun playing over the active rhythm section. A short piano solo opens "'Round Midnight" (very hip audience in attendance - they applaud the melody) before Montgomery leads in the theme and takes the first solo. When Griffin enters he plays one line then sings a short reply and gets a big laugh from the band. The solo that follows is actually quite serious and ranges far afield. Griffin has a great time on Dizzy Gillespie's "Blues and Boogie" - he enters quietly after Montgomery's romping solo but soon digs in and creates a rollicking statement, complete with quotes from several children's songs and more. The rhythm section has a great time as well. When they drop out, Griffin goes it alone for over two minutes, riffing on a theme with great power and joy. 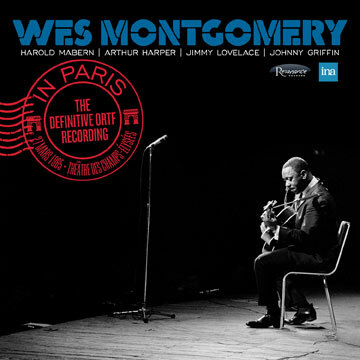 "Wes Montgomery In Paris", a bootleg no more, is 105 minutes of impressive musicianship, bluesy twists and turns, and melodic adventures. The rhythm section gives the leader great support throughout and the addition of Johnny Griffin is a real treat. The sound is quite good save for a bit of a drop off when Harold Mabern moves into the higher registers of the piano (his "comping" is quite audible). The sound of the bass and drums is excellent throughout while the guitar dominates without being harsh or annoying. 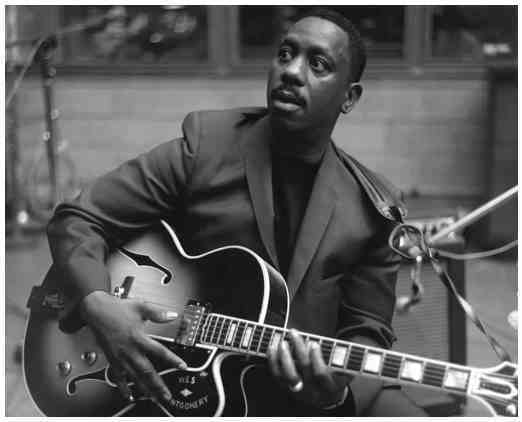 All in all, a treat for guitar fans and, especially, for people who like the jazzy side of Mr. Montgomery. For more information, go to www.resonancerecords.org/release.php?cat=HLP-9032. Producer Marc Free, who sets the pace at Posi-Tone Records, always signs his emails "Keep on swingin'" - that would certainly be the motto for this group the producer put together. 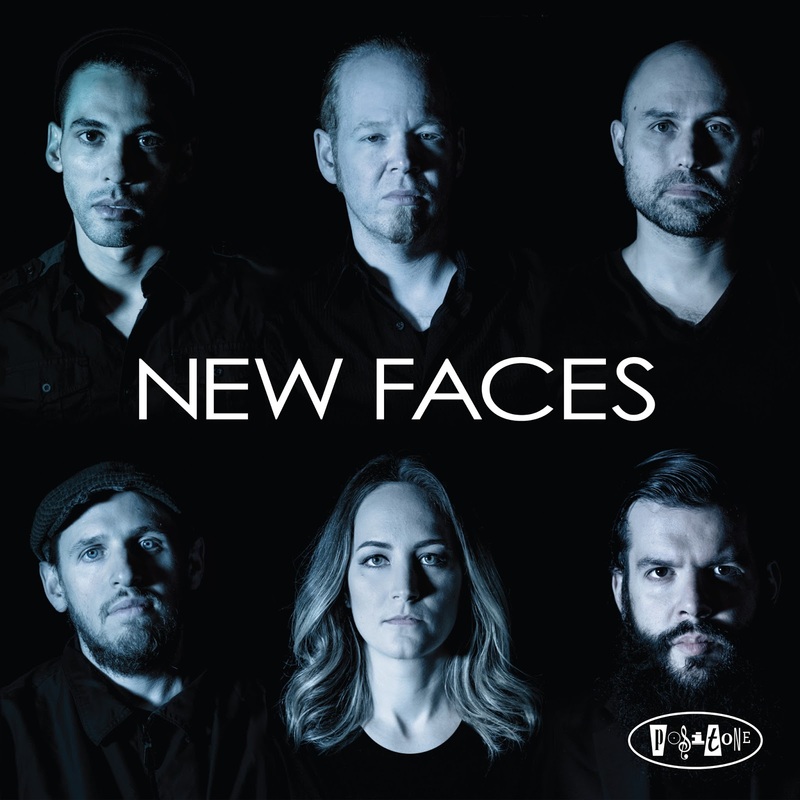 The sextet and its debut album is called "New Faces": the ensemble includes vibraphonist Behn Gillece, tenor saxophonist Roxy Coss, trumpeter Josh Lawrence, pianist Theo Hill and the "veteran" rhythm section of bassist Peter Brendler and drummer Vinnie Sperrazza. Every member has, at least, one album on the Posi-Tone label or has been featured one of the label's many recordings. The program is split between songs from deep in the label's catalogue, new pieces from the vibraphonist and the pianist plus Herbie Hancock's "King Cobra" (from his 1963 Blue Note Lp, "My Point of View"). With its airy feel and open chords, the Hancock composition posits the album in the era of "progressive hard bop" - listen to how the rhythm section plays with the tempos under the soloists. The piece simmers and it's that feel that permeates much of the album. Opening with pianist Jon Davis's "Happy Juice", the music has a delightful swing, the melody glides forward, and the soloists (Lawrence. Ms Coss, and Gillece, each create swinging solos. The second track, "Delilah Was a Libra", comes from one of the earliest albums in the label's catalog "Trapdoor" by the guitarist known as Edwing (issued in 1995). The piece has a modal feel and the rhythm section really push this forward - Lawrence, Hill, and Ms. Coss each create fine solos. 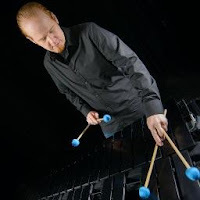 Of the three tracks composed by vibraphonist Gillece, "Down the Pike" leaps out of the speakers thanks to the drive supplied by Sperrazza, Brendler, and Hill. The ethereal opening of his tune "Vortex" (with the chimes of his vibes) may remind some of the late Bobby Hutchinson's work on "Maiden Voyage" as will the handsome melody (Lawrence has a such a fine tone). Ms. Coss does not rush through her tenor solo, enjoying the great support as she moves easily through the changes. Gillece's final contribution, "Follow Suit", starts slowly but then the sextet takes off on a joyous romp with rapid-fire solos from the composer, Lawrence (one hears Lee Morgan in his playing), Ms. Coss (whose power matches that of the rhythm section, and closes with short statements from Hill and Sperrazza. The hard-bop swing of Lawrence's "Hush Puppy" is a giddy trip through a sweet melody and strong solos. However, he adds a delicious Latin concoction to the mix with his piece "Frederico." Leading with his muted trumpet playing the melody with the tenor sax, the piece conjures up a smoky nightclub with the band having a great time. Pay attention to the excellent work of Hill whose background chords and fills are a lesson in how to create a fine foundation for the soloists. Of course, Brendler and Sperrazza keep everyone on their toes with their tasty accompaniment. 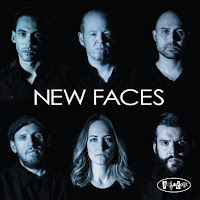 "New Faces" is a tasty concoction, an album that is sneaky good. On the surface, most of the music sounds "straight-ahead jazz" and it is. But, listen closely to the excellent rhythm section, to the intelligent choice of tunes, and to how the "front line" responds to all the different types of tunes. Best of all, it's fun to listen to. For more information, go to www.posi-tone.com/newfaces/newfaces.html. 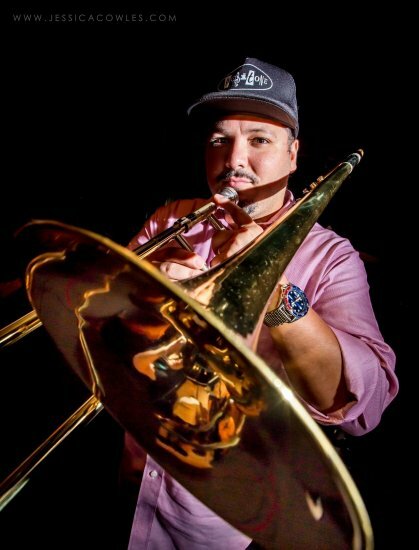 Trombonist and educator Michael Dease puts together a fine ensemble for his new Posi-Tone release (his fifth for the label). 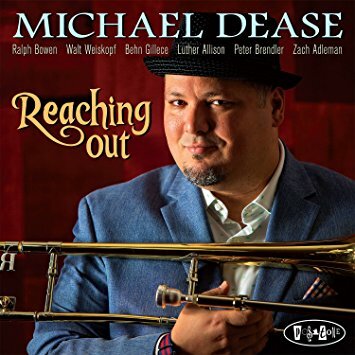 "Reaching Out" blends his young rhythm section of pianist Luther Allison (who played drums on Deases's 2016 "Father Figure" CD) and drummer Zach Adleman (a student of the trombonist at Michigan State University as is Allison) with veterans Peter Brendler (bass), Ralph Bowen (tenor saxophone), Walt Weiskopf (alto and tenor saxophones), and Behn Gillece (vibraphone on three tracks). The program is an intelligent blend of standards, newer "pop" tunes, and several originals. The reed players appear together on eight of the 11 tracks. Bowen also has a smashing interaction with the leader and the rhythm section on the rapid-fire reading of Steve Turre's "Blackfoot" while Weiskopf joins Gillece on Dease's Herbie Hancock-like "The Chameleon Eye." 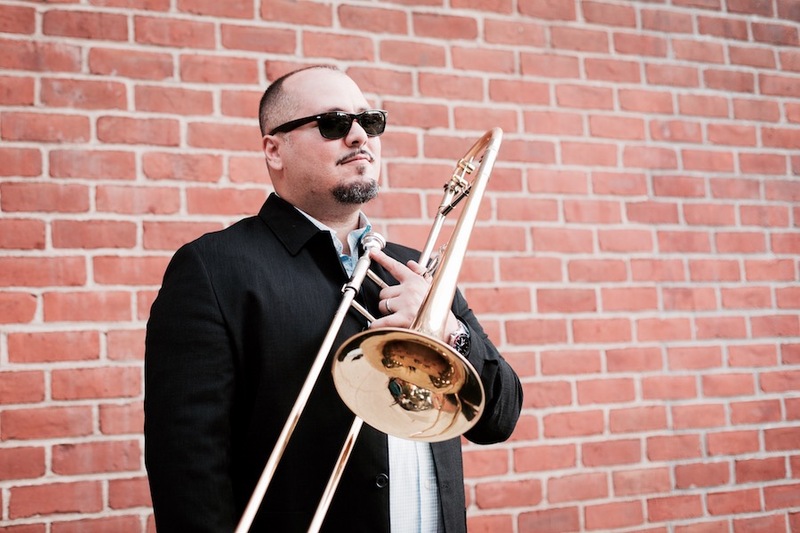 Dease reminds me a lot of fellow trombonist Steve Davis. He's possesses a buttery tone, can play in many different styles, is a top-notch educator and mentor. Plus, both men can swing with abandon. There are several tracks that "burn" from the opening notes. The opening track, "Something In Common" (composed by Cedar Walton), simmers and features powerful solos from the leader, Bowen, Weiskopf (alto), and Gillece. Deanne's "Tipping Point" may have the most fire on the album, with exciting solos from both the alto and tenor saxophonists, the leader, and a rollicking "trading 8's" with Adleman. There are three fascinating covers on the album that speak to Dease's upbringing, the "pop" music of his youth, "More Than Words", a big hit in 1990 for the metal band Extreme, is a sweet mid-tempo ballad with the reeds and brass playing sweet harmonies and counterpoint. Babyface's "Water Runs Dry" was a hit in 1994 for Boyz II Men and is given a similar arrangement to the Extreme tune. The sextet (all but Gillece) treat the melody with respect while Dease's solo has, at times, a fine vocal feel. Perhaps the biggest surprise is the inclusion of Paul McCartney's "Live and Let Die" - the original, because if its connection to the James Bond movie franchise, is, at times, bombastic. But Dease and company not only swing the heck out of the song but also give a strong blues feel. There's a powerful "trading 4's" section with the brass and reeds and the vibes add a powerful touch in the final minute of the piece. "Reaching Out" is melodic, exciting, and quite accessible. Michael Dease shares the spotlight throughout the album and both Ralph Bowen and WaltWeiskopf take full advantage of the solo space (they trade phrases with abandon on "Morning Shade") as well as serve as smart counterpoint on a majority of the tracks. Pay attention to the contributions of the "kids", Luther Allison and Zach Adleman: they play well now and will only get better and smarter. Posi-Tone "keeps on swinging" and we are the beneficiaries! For more information, go to www.posi-tone.com/reachingout/reachingout.html and to www.michaeldease.com. 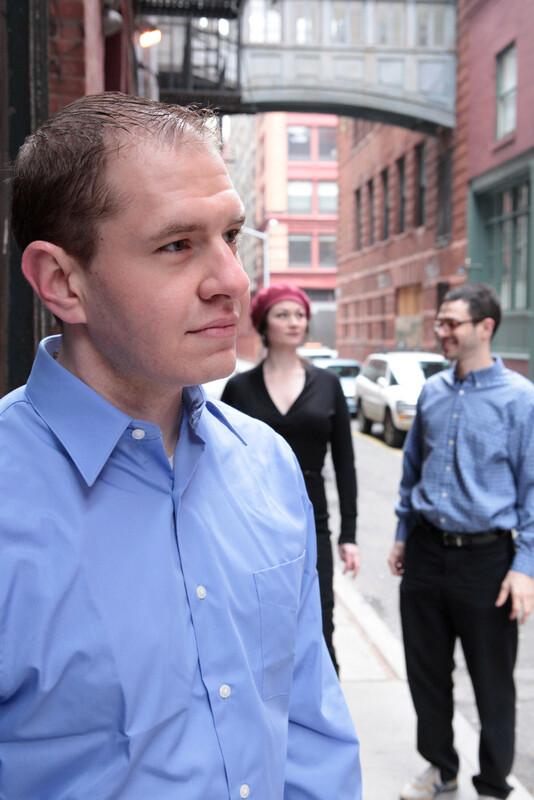 Pianist-composer Jeremy Siskind created the Housewarming Project after the 2012 release of his BJU recording "Finger-Songwriter." 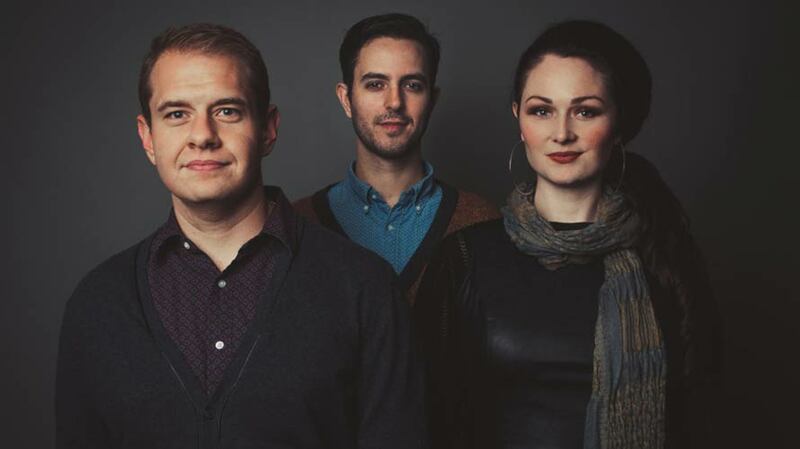 That splendid album (reviewed here) featured the attractive voice of Nancy Harms and the excellent reed work of Lucas Pino (clarinets, saxophones): early 2015 saw the release of "Housewarming" (BJU) with the same lineup plus guest vocalists Kendra Shank, Peter Eldridge, and Kurt Elling. The two albums not only shone the light of the excellent interactions of voice and instruments. The first album featured 11 original compositions dedicated to poets and authors plus a delightful cover of Billy Joel's "All You Wanna Do Is Dance" (from 1976's "Turnstiles" album). The second album included nine originals, three standards, and an inspired rendition of Adem's "Everything You Need" from 2004. The trio has spent considerable time performing "house concerts" (makes sense, giving their intimate sound) not only because the songs seem so personal but also it's easier to connect with the performers and see how they work, how they play, interact, and enjoy what they do. 2018 brings "The Housewarming Project", a multi-media venture that continues and builds upon what Siskind and his bandmates have been doing for the past six years. The group started releasing videos on its YouTube channel in January and plan to continue into March. Titled "at_Home/at_Play", the series features performances from the Blue Whale in Los Angeles and from videos made "at home" in San Diego, CA The trio performs new pieces as well as revisiting songs from their albums. Along with the videos, one can download a five-song EP (free or "name your price") from housewarmingproject.bandcamp.com/releases. 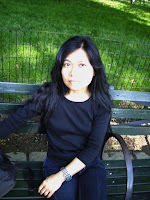 And Siskind is blogging about all the songs which you can find by going to mfasiskind.wordpress.com. One could just set the YouTube channel to continuous play and have your own house concert in your living room. There's a delightful blend of music. There's the uptempo and hilarious "If You Can Read (You Can Cook)" that features guest Dan Ogrodnik on pandiero, the quiet and wistful "Melancholy Times", the dramatic "Vanished Music, Twilit Water" (for Seamus Heaney), the sweet, jazzy, ballad "Whispering Grass", and rapid-fire "Sometimes I Wander." One could easily concentrate on Ms. Harms and the versatility of her voice, the emotional richness but you could - and should - pay close attention to the splendid keyboard work of Siskind, not just his technical prowess but the rich melodies he creates. Pino doesa delightful job of wrapping his clarinet sound around the vocal, sometimes shadowing the melody or playing counterpoint to the piano. The dark tones of his bass clarinet, the bluesy swagger of his tenor saxophone (check out his husky tones on the Gershwin-esque "The Inevitable Letdown" as well as the delightful "rent party" piano solo), all point to how important the reeds are to the overall tone of this Project. Intelligent words and excellent music, real emotions and myriad colors, "The Housewarming Project" is such attractive and adult music. The intimacy of the performances, the sumptuous melodies, and the wonderful musicianship makes "The Housewarming Project" worth paying attention to. The YouTube channel is found at www.youtube.com/channel/UCo23Y7J1cwrH5BWW6TPG6sQ - dig around, have fun, buy the EP, and check out this trio's fine recordings. For even more information, go to www.jeremysiskind.com. 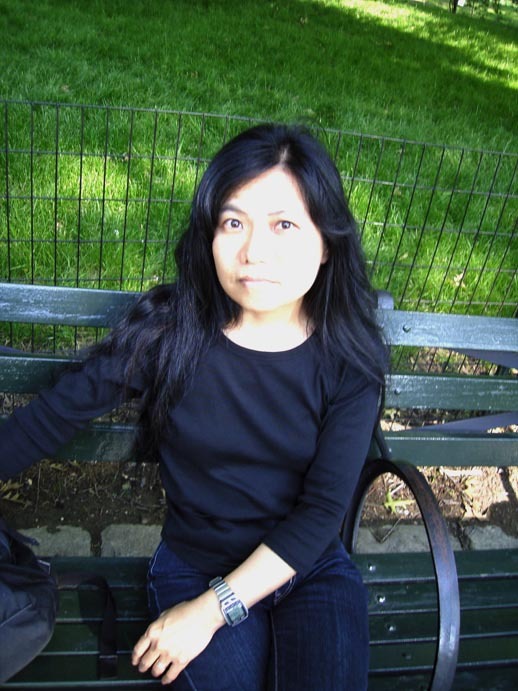 2018 is the year of pianist, composer, and arranger Satoko Fujii's 60th birthday. She's celebrating with her fans and new acquaintances by releasing an album every month. January's entry is "Solo" (Libra Records), recorded on the afternoon of July 9, 2017, in Yawatahama, Japan, approximately 530 miles to the southwest of Tokyo. As much as I enjoy Ms. Fuji's projects with her various large ensembles as well as her work with husband and trumpeter Natsuki Tamura (they share several projects), her solo piano outings are always fascinating and this album is no exception. There are moments of great beauty and solemnity, there are moments of vigor and furious sounds - playing inside the piano, dampening the strings that certain notes sound like small bells ("Ninepin") and giving the high keys a more percussive sound ("Gen Himmel"), Ms. Fujii plays the entire piano. Listen to "Spring Storm" as the music dances up from the bass notes, imitating rain drops, swirling sounds out of the piano, until the low notes reluctantly give way to a lovely melody. The lines clash, come together, break apart, push at each other, until the storm picks up in intensity - now the phrases are spilling out of the piano but the listener need not take cover. The final track is a whisper-thin reading of "Moonlight", a truly lovely ballad composed by the late reed master Jimmy Giuffre. The notes are so well articulated, so clear, one imagines standing on the back porch in the country, staring at the sky. Her left hand strumming inside the piano as the right plays a rippling melody, the music is suspended in the air and we are still, like the evening breeze, we are quiet, like the song birds sleeping in their nests, as the melody slowly comes to a close. 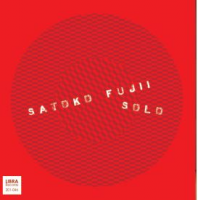 If you listen to a lot of the music that Satoko Fujii creates, "Solo" may surprise you. There is plenty of power in her percussive left hand on certain tracks but there are also many moments of tenderness. Yes, there is angularity in her melodies and solos but she also gives pieces where the rhythm carries you rapidly forward (all of that and more happens in nine+ minutes of "Geradeaus"). Approach this album with open ears and you will reap musical rewards. For more information, go to www.satokofujii.com. Pianist and sonic adventurer Kris Davis inaugurated her Pyroclastic label in September of 2016 with the 2 CD "Duopoly", an album on which she played duets with reed players Tim Berne and Don Byron, drummers Billy Drummond and Marcus Gilmore, guitarists Bill Frisell and Julian Lage, and pianists Angelica Sanchez and Craig Taborn, a smaller version of Noah's Ark. Her second album on the label, "Octopus", is also a duo album but this time it's her with Taborn. The pianists did a 12-city tour, each bringing new compositions (two for Ms. Davis, three for Taborn) plus one each from Carla Bley and Sun Ra, What stands out on th initial listening is how compatible and flexible the duo is. Since both are excellent improvisers, these pieces blend a sense of adventure with melodic freedom and rhythmic experiments. This is one of those programs where you should just sit back and let the music wash over you. Pretend you are in the audience, watch the pianists, allow your mind to wander. 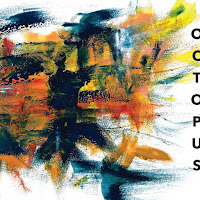 Pieces such as the opening track "Interruptions One" (all three of Taborn's pieces share that title) flow out of the opening moments, moving in unexpected (for the listener and, probably, for the musicians) directions. 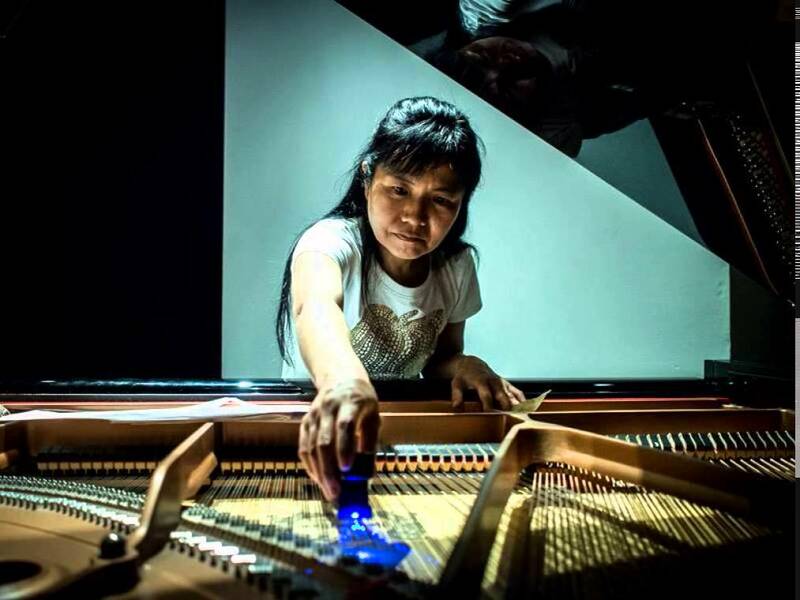 The pianists are interacting, responding to musical cues, to the lines each one is playing, building off the intensity or the quiet, and then pushing the music towards a new area. Ms. Davis's "Ossining" has quite a pulse, one that shifts, morphs, continually moving forward. Through the first several minutes, it reminds this listener of the percussion pieces that Steve Reich has written, works that develop slowly but keep our attention because the rhythm is so pronounced. 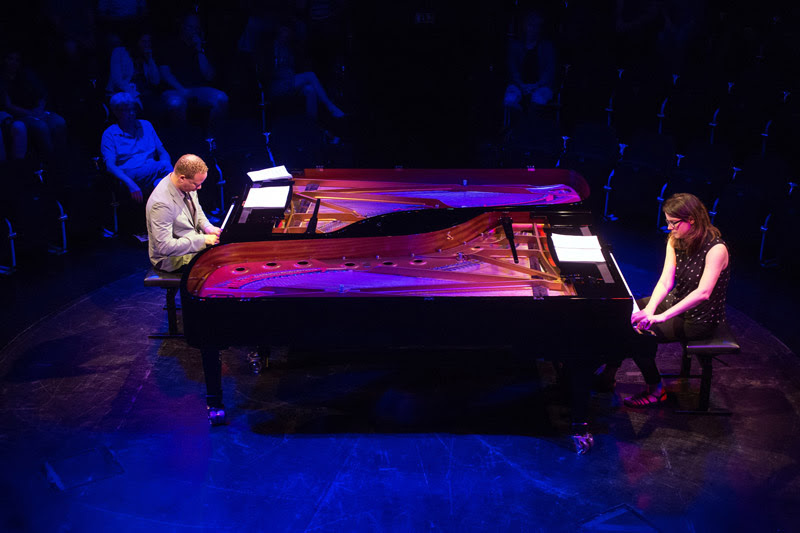 When you think it's over, the duo turns the piece inward on long, flowing, impressionistic melodic fragments and the closing moments are mesmerizing. 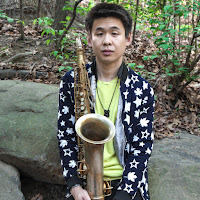 Every track is a highlight, from the aptly named "Chatterbox", an intense workout that does flag from the opening clusters, to the powerful reading of Carla Bley's "Sing Me Softly of the Blues" (first recorded by the Art Farmer Quartet in 1965 followed by Gary Burton Quartet in 1967) - the piece transforms into Taborn's "Interruptions Two", a dramatic ballad that moves away from its powerful chord towards a reflective interaction between the pianists. The album closes with a stunning performance of Sun Ra's "Love In Outer Space." There are a number of versions by the composer but none that have the luxurious opening of this two-piano reading. The piece builds slowly but surely to a powerful climax, a rolling, roiling, rhythmical drone that drops to a quiet finish. "Octopus" is quite an artistic accomplishment. 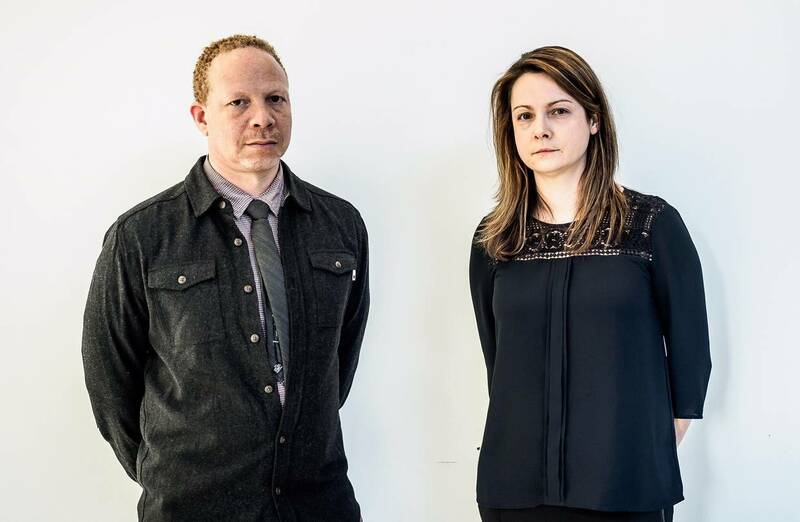 Two pianists, Kris Davis and Craig Taborn, each with an individual style, coming together and creating such fascinating music. Both have proven themselves to be intrepid experimenters, musicians who do not follow trends but follow their passions. For more information, go to krisdavis.net. To watch one of the duo's concerts (from Millennium Stage of the Kennedy Center n Washington, DC, go to www.youtube.com/watch?v=I4Eu80jR9Kk. Many people know Lewis Porter from his excellent books on John Coltrane, Lester Young, and his various "Jazz Perspectives" books. Dr. Porter teaches at Rutgers University where he created the Masters in Jazz History and Research. 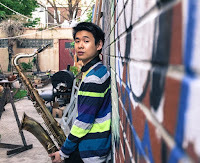 In addition, he's also an accomplished composer and pianist with recordings that feature him with saxophonists Dave Liebman and Chris Kelsey and trio date with bassist Joris Teepe and drummer Rudy Royston. 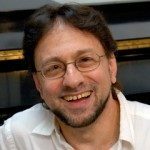 This past month, pianist/composer Porter has released a Quartet date co-led by saxophonist Phil Scarff (on Whaling City Sound) and "Beauty & Mystery" (Altrusioni), a session that features bassist John Patitucci and drummer Terri Lyne Carrington plus saxophonist Tia Fuller (on two of the 10 tracks). It's the latter recording that is our focus. With the exception of the opening "Prologue", which is a solo piano piece, the trio dives into a program that features originals, a piece by one of Porter's former students Ted Chubb, and two inspired covers. The dancing-on-air version of "Bye Bye Blackbird" illustrates how well the three musicians interact with the pianist and bassist playing off the melody and through the piano solo while Ms. Carrington's delightful brush work sizzles underneath. Patitucci moves into a brisk waking bass while Porter frolics atop the brisk rhythms. Curtis Mayfield's inspirational "People Get Ready" opens rather solemnly with the piano introducing the melody. The bassist takes over for the first verse before the pianist returns with a wonderful solo (especially the chordal work in the middle of the song). One is touched by the power, the hope, and the humanity in this performance. 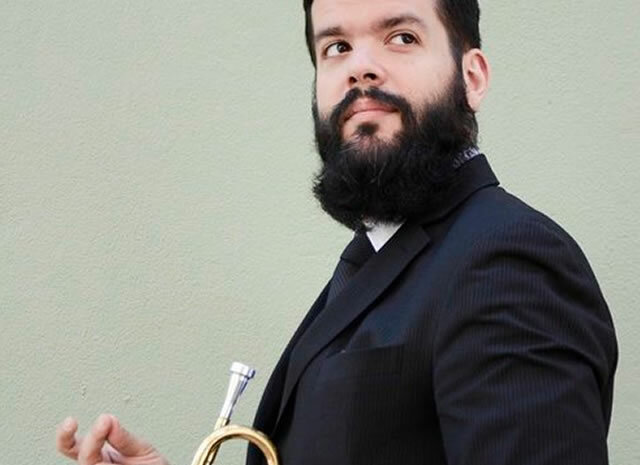 "1919", the piece by Chubb, is a lovely ballad that the composer/trumpeter first recorded on a 2009 CD he made with Mike Lee. It's a treat to hear three musicians listen to each other, support each other, and play with such emotion, emotion that does not feel forced or contrived. Three of the original pieces have connections to John Coltrane. The uptempo "Birthplace" features Ms. Fuller on soprano sax sharing the main melody with bowed bass while the piano and drums build a fire underneath them. The saxophonist takes her cue from that powerful foundation and creates a stunning solo, her lines swooping, flying upwards as if freed from her earthly bounds. Porter also unleashes a powerful solo, he too feeding off the rollicking rhythm section. Ms. Fuller returns on "Blues for Trane and McCoy", this time on alto saxophone. Before she enters, the trio go on quite a romp with the pianist happily leading the way. The sax solo is no afterthought: the intensity level drops for her introduction (but pay attention to how Patitucci and Ms. Carrington support her) and she creates quite a delightful, exciting, solo. "From Giovanni to Jimmy" is a spotlight for the bassist and a nod to one of his most important influences, Jimmy Garrison. It's a handsome, medium-tempo, ballad with a fine, elongated, melody line (of the three Coltrane-related tracks, this is there only one where you can really hear the influence of MyCoy Tyner. The music also has a delightful flow, Ms. Carrington pushing the piece forward while the bass and piano interact, play counterpoint, and dig deeply into the bluesy chords that are the foundation of the music. The unaccompanied bass statement that closes the piece is stunning and heartfelt. 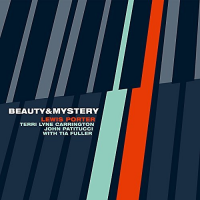 "Beauty & Mystery" is the perfect title for this album by Lewis Porter. The playing of the pianist with Terri Lyne Carrington, John Patitucci, and Tia Fuller, is creative music at its best. 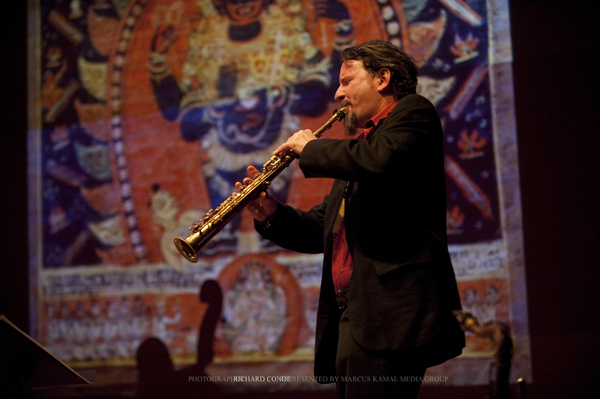 While the music pays tribute to several of Porter's influences (as well as his love for ragas), the results sound contemporary and alive. Find it, play it loud, and climb into these captivating sounds. For more information, go to www.lewisporter.com.